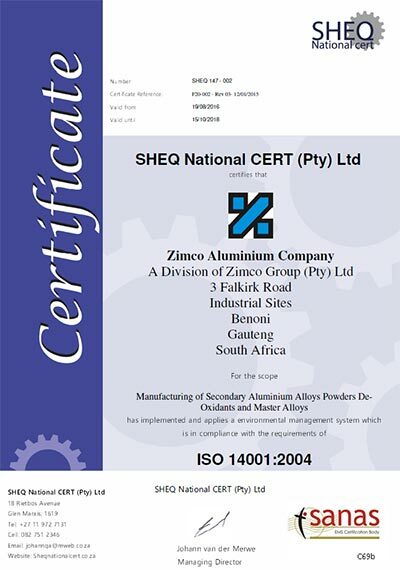 Zimalco has been certified to the ISO 9001 quality standard for more than 20 years. 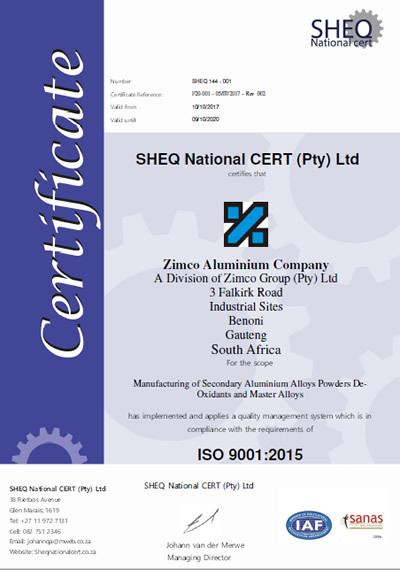 Zimalco has been certified to the ISO 9001 quality standard for more than 20 years which has contributed to the high quality standard of products and service for which the company is renowned for. 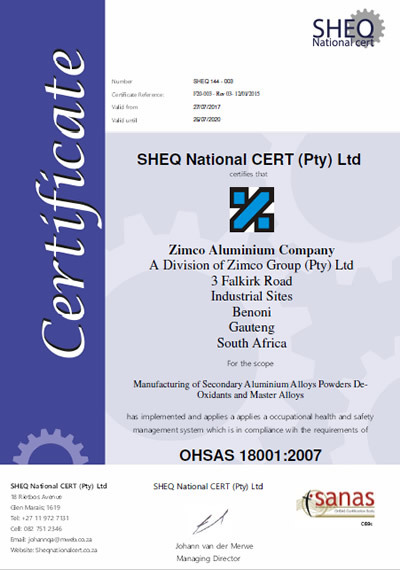 Zimalco has assured and continues to enhance the health and safety of each and every employee and visitor on site by adopting a "Safe for life" strategy and successfully implementing the OHSAS 18001 standard. This standard is the driving force to ensure that each and every individual on site is protected by the Occupational Health and Safety Act, 1993 as well as the requirements set out by the Zimco Group and our shareholders. As with all foundries and smelters Zimalco has several impacts on the environment, not only the immediate surroundings and community, but also those areas influenced by the use of our products. The energy and raw materials used to create our products and the disposal of our various waste types also has a major impact on the environment. The waste generated by the plant is carefully managed to ensure the notion of reuse and recycling is adhered to as far reasonably possible. To control these and other impacts Zimalco has adopted all the relevant requirements of the National Environmental Management Act, 1998. To manage these controls Zimalco has been certified to the ISO 14001 standard. In the recycling of Aluminium, Secondary Aluminium Smelters use only ± 5 percent of the energy required by Primary Smelters, however Zimalco still needs to efficiently manage the use of its energy. To assist in achieving this Zimalco has been certified to the ISO 50001 standard for energy management.